As digital dating abuse emerges as an epidemic among young people, the need for education and intervention is also on the rise. DALLAS – Oct. 30, 2017 – As digital dating abuse emerges as an epidemic among young people, the need for education and intervention is also on the rise. Today, Mary Kay released more data from its eighth annual Truth About Abuse Survey revealing that 89% of young people are confident they know what a healthy relationship looks like and yet, 68% have actually experienced digital dating abuse. As young people navigate the complex combination of today’s dating scene alongside social media, the new survey provides insight on gaps in resources and education. 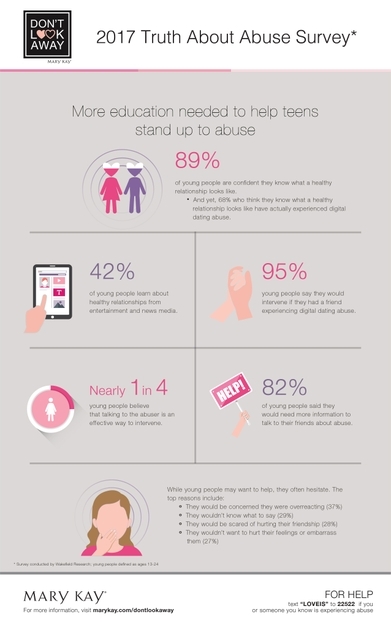 Get the right help: experts agree that confronting an abuser can put a victim in danger, yet nearly 1 in 4 (22%) young people incorrectly believe that talking to a friend’s partner is an effective way to intervene. Social influence: 42% report that they learn about healthy relationships from entertainment and news media. Intervention: 95% say they would want to intervene if a friend experienced digital dating abuse. The 2017 survey is part of Mary Kay’s Don't Look Away campaign which works to educate the public on recognizing the signs of an abusive relationship, how to take action and to raise awareness for support services. In partnership with Wakefield Research, 1,000 young people ages 13-24 nationwide participated in the survey as a representation of America’s young population. Mary Kay is also the lead sponsor of the nation’s first-ever text-based helpline operated by loveisrespect. By simply texting ‘loveis’ to 22522, teens and young adults are safely and discretely connected to trained peer advocates who provide support, safety tips and referrals for their own relationships or a friend’s. To date, Mary Kay Inc. and The Mary Kay Foundation℠ have given $57 million to domestic violence prevention and awareness programs in an effort to end the cycle of abuse.